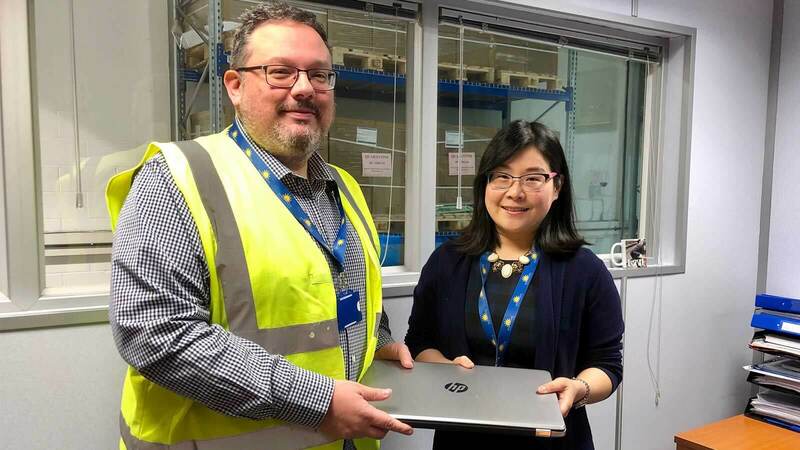 A sale of old Morningside Pharmaceuticals’ computers and laptops has raised £800 for a children’s charity. The fundraiser was held after the computers became surplus to requirements following an upgrade of our IT infrastructure. The items were earmarked to be recycled, but at Morningside we’re always looking for ways to support the community and charities, so a fundraising plan was devised. To help raise funds colleagues were asked to make a donation for each item, which has now been donated to the Children with Special Needs Foundation. Colleagues were then able to benefit from the use of almost new IT equipment, while also supporting a good cause. Monica Huang, Morningside’s Operation’s Director, said: “At Morningside we’re committed to working with communities to bring them together and to improve the quality of life of the people living there. The foundation raises funds to support individuals, groups and schools in their requests for equipment, holidays and tuition and to provide essential care for children with special needs. This also includes assisting very talented children who are finding it difficult to reach their true potential without support. Gordon Parris MBE, from the Children with Special Needs Foundation, said: “Very many thanks indeed for the wonderful donation of £800, which we recently received from Morningside Pharmaceuticals. “It came as a complete surprise and particularly at Christmas time, when we try and give families that little extra to help them have a good time. To find out more about Morningside’s charity and community support visit here.